Because of work, I ended up having one of these routers. Having an EdgeRouter Lite to add new features in to it seemed fun. The software that powers it is pretty well known as a fork from Vyatta Core back in the 6.3 days along with Cavium’s IP Offload module that enables it to forward packets at 1 Million per second for 64 byte packets (That’s as low as an Ethernet frame can go, by the way). 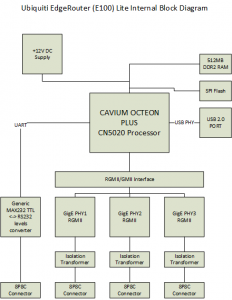 It’s also well known that the SoC used in this particular model is manufactured by Cavium. 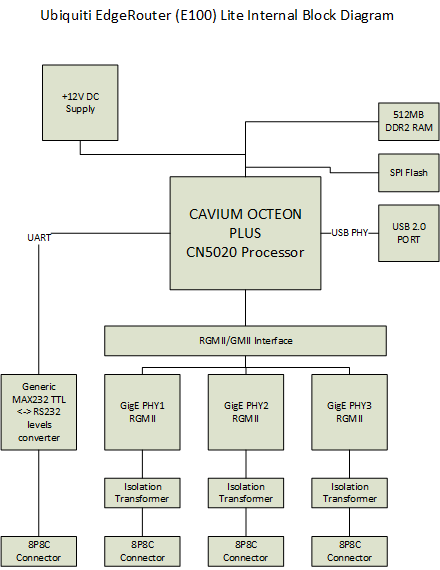 I hope this simple block diagram above gives people out there a better understanding on how things are interfaced with the SoC. Have fun!